Michael Kind|! !| left|! !| CEO of Right Height Manufacturing in Manchester|! 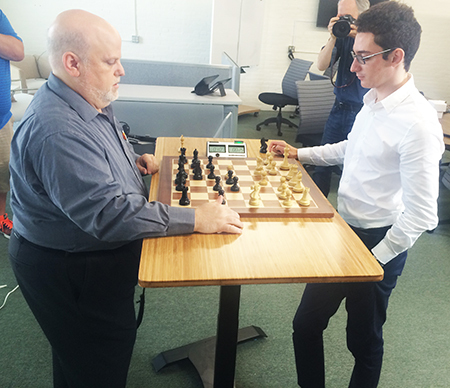 !| and grandmaster Fabiano Caruana play a game of chess on an adjustable-height Prodigy Desk|! !| being built by Kind’s company with help from Caruana. What was Fabiano Caruana, the United States’ best hope since the Great Depression to win the international Chess Olympiad, doing in the Manchester Millyard just a few weeks before the opening of the Sept. 2 contest in Azerbaijan? Promoting an adjustable desk – the Prodigy Desk, designed by Fabiano and built by Right Height, a company located at 150 Dow St. The desk is built for kids, with some of the proceeds going to support chess programs in schools. Think of LeBron James dropping in at Planet Fitness headquarters to promote a special headband before the NBA championships to encourage fitness at an early age. Because Fabiano (does Madonna go by her last name? ), who turned 24 at the end of July, is at that level. The reigning national chess champion is the third best player in the world. Indeed, at his previous peak – which was less than two years ago – he was at the third highest level in the history of the game, way higher than the best known American chess player in history, Bobby Fischer. Fabiano is quick to point out that the game has changed since the 1960s and ‘70s, when Fischer reigned supreme. Like Fisher, Fabiano grew up in Brooklyn, though he was born in Miami, not Chicago. He started playing chess at 5 and was soon discovered at the Berkeley Carroll School, a private prep school in Brooklyn. Like Fischer, Fabiano cut his teeth among the chess players who famously gather in Washington Square Park in Greenwich Village. By the time he was 12, he advanced to the next level – Europe. He moved with his family to Spain, partially for the family to experience the continent, but it was also because, “at the time, the level of competition in Europe was far ahead of the United States, so it was best to train and play in Europe,” he says. Fabiano participates in about 10 tournaments a year – a grueling schedule, because in addition to the match he spends nearly the whole day preparing. When he is not competing, he spends about two hours a day following what other strong players are doing in their tournaments, trying to improve his end game and to come up with new ideas for openings. The Olympiad, held every two years, a 12-day tournament. Two years ago, he represented Italy, where he is also a citizen, but last year he switched to the U.S. team, and in April became national champion. He is playing “lead board” for the U.S. team, which has three out of the top seven world-ranked players. As a whole, the United States is just ranked below Russia and just above China. So how did he end up in Manchester? It was a partnership first forged last year at the Millionaires Chess tournament in Las Vegas, when Mike Kind, CEO of Right Height and one of Fabiano’s biggest fans, got up the gumption to walk across the hall and shake his hand. 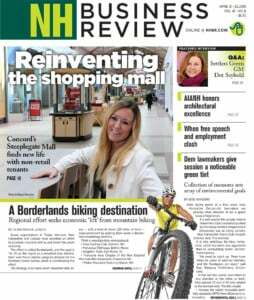 Kind is not a bad chess player himself, with the 21st best rating in the Granite State. His company builds adjustable desks, custom-made for businesses, and had been doing rather well, with sales increasing about 30 percent over the past few years. But Kind had the idea of a desk marketed for kids. The desk is compact and on wheels, so it can easily be pushed into a corner. There is something like it on the market, he said, Varidesk, but you have to push it into position. He developed the Prodigy Desk with an electric motor that adjusts at the push of a button. It ranges from 22 inches for a primary school student sitting down to 51 inches, for a high school student standing up, with four bookmarked settings for several members of the family or for various positions. “This way they can sit, they can stand when they are getting fidgety,” he said, citing studies that show that such changes can help kids stay on task and improve their performance. Fabiano and chess came into the picture because of the connection between STEM (science, technology, engineering and mathematics) and chess. Just Google the two terms, and you come up with several articles about how chess is a gateway to STEM. But Kind, a chemistry major, felt the nexus on a personal level, saying the logic and strategy prepared him both for science and business. These were some of the selling points that Kind pitched to Fabiano and his team in signing on to the partnership. The other was that 5 percent of the proceeds would go to Chess-In-The-Schools, an organization that helps fund chess clubs in New York City’s poorer schools. “It’s a way of giving back,” he said. It’s also a business partnership. Prodigy Desk is a separate company that markets the 120-pound desk, signed by Fabiano, for $399, with Jonathan Brownfield of Lift Digital Media selling it online. Right Height supplies the desks, and Fabiano will either get a percentage of the sales or a percentage of the company — the exact details are still to be worked out, said Kind. Aside from backing the concept, deals like this could help add some stability to a career path that can often come to a dead end at an early age. Fischer topped playing chess regularly in the mid-‘70s, after drifting into controversy because of his anti-Semitic tirades. But Fabiano doesn’t think that his success will go to his head. “I’ve lost so many games over the years. Anything can go wrong at any moment. I’ve had very bad tournaments that have brought me back to reality,” he said. He noted that some players play into their 40s, even their 60s. So is this going to be Fabiano’s life for the next couple of decades? “I don’t know, but that’s the plan,” he said.